When it comes to make up brushes I will openly admit I am pretty picky. My feeling is there is little point in investing in expensive make up if you try and apply it with poor quality brushes and having owned some of my brushes for longer than I care to remember I also think you get value for money if you make the initial investment. With that being said I am not averse to trying out some more affordable brushes and I own some that I use on a daily basis so when I saw this Japonesque velvet touch brush set for such a bargain price I had to try them out and I am really glad I did. 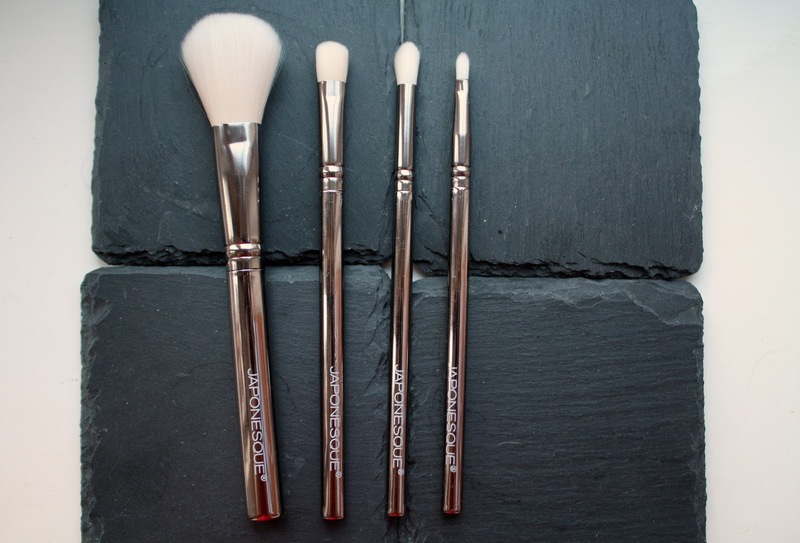 The set contains four brushes with a combined value of £39 for just £19. Included is a powder brush, a fluffy shadow brush, a crease brush and a lip brush and they are all synthetic. The powder brush is quite small and incredibly soft – they really do live up to their name. I have been loving this brush for applying blusher but it would also work really well to powder smaller areas of the face such as through the t-zone or under the eyes. The fluffy shadow brush isn’t actually all that fluffy, it’s really dense and stiff enough to pick up and place shadow easily. The crease brush is my favourite from the set; it is like a smaller version of the MAC 224. I like it because it’s so soft and its slimmer than most blending brushes meaning you can be more precise in the crease or under the eye. I like the lip brush but I will probably use it more for under the eye or for highlighting the inner corner of the eye and under the brow bone. These are the first brushes from Japonesque I have tried but I’m so impressed I will definitely be picking up a few more. Have you tried any Japonesque brushes? If you have any recommendations please let me know!